Above is the bright new foliage of golden hops (Humulus lupulus ‘Aureus’), back on May 12th. 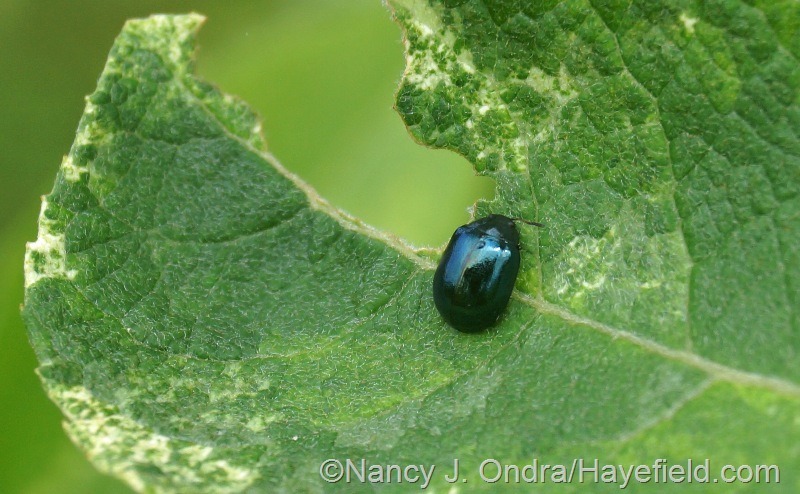 Usually, that’s the best it gets for me, because some pest shows up in late May or early June and skeletonizes the leaves by mid-June. But for whatever reason, there’s been no damage at all this year, so the leaves are still looking great. The mature leaves are deep green by now, but the shoot tips are still producing lots of chartreuse new growth. Below is ‘Isla Gold’ tansy (Tanacetum vulgare) on June 21st, against the dark leaves of ‘Velvet Cloak’ smoke bush (Cotinus coggygria). Above is ‘Sunset’ hens-and-chicks (Sempervivum tectorum), back on May 12th. It’s now more of a pale green overall: not nearly as distinctive as the spring color. 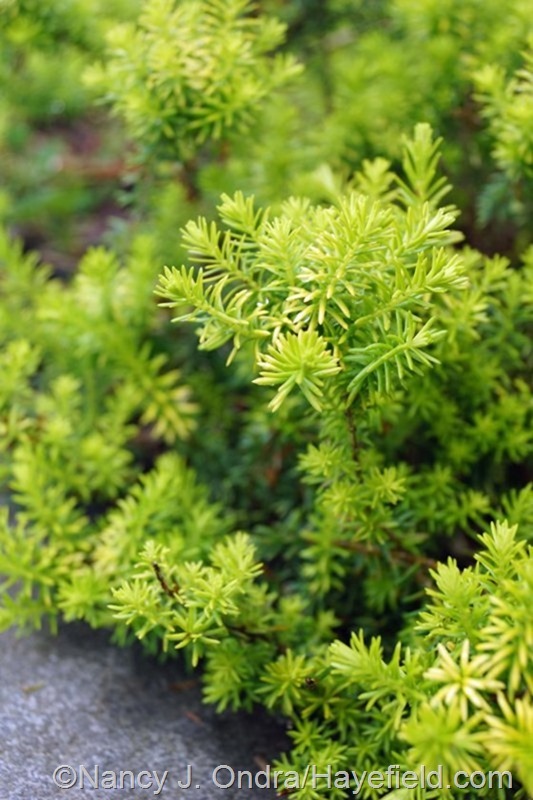 Below is ‘Golden Starlet’ winter heath (Erica carnea), the only heath I’ve ever been able to grow successfully. The foliage (shown below on June 9th) is cheery, but that’s not its only good feature: it’s also consistently in bloom from October into April, with tiny white flowers. 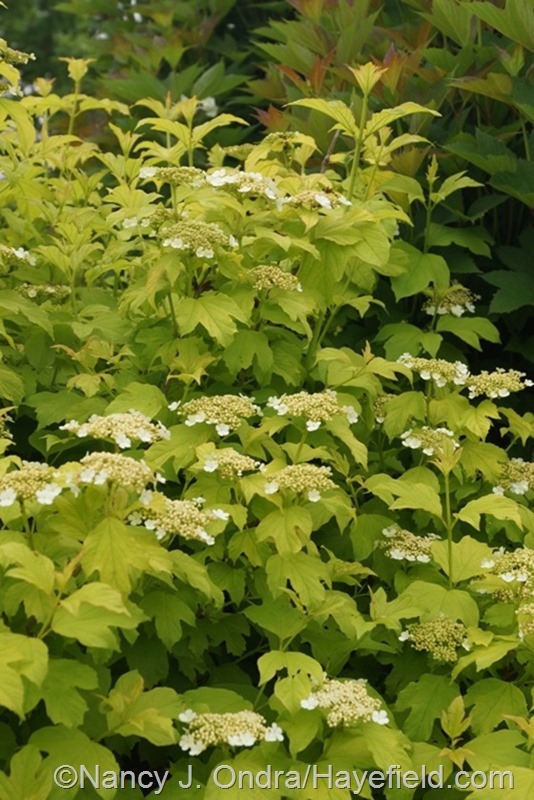 Above is golden European cranberrybush viburnum (Viburnum opulus ‘Aureum’), just coming into bloom on May 29th. The leaves still look this good, but they’ll eventually get a bit scorched when we get a spell of really sunny, hot days in July. Below is golden wafer ash (Ptelea trifoliata ‘Aurea’) on June 9th. 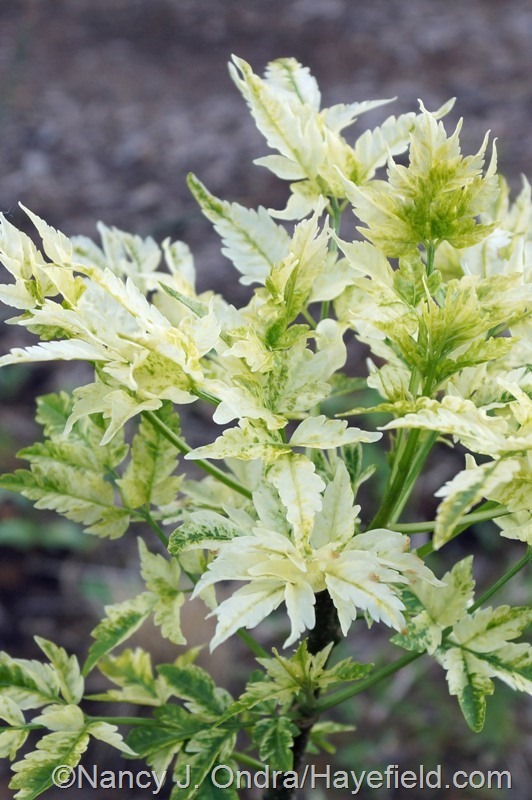 Also known as golden hoptree, this beauty comes true from seed. It’s one of the last trees to leaf out here, but it’s worth waiting for. 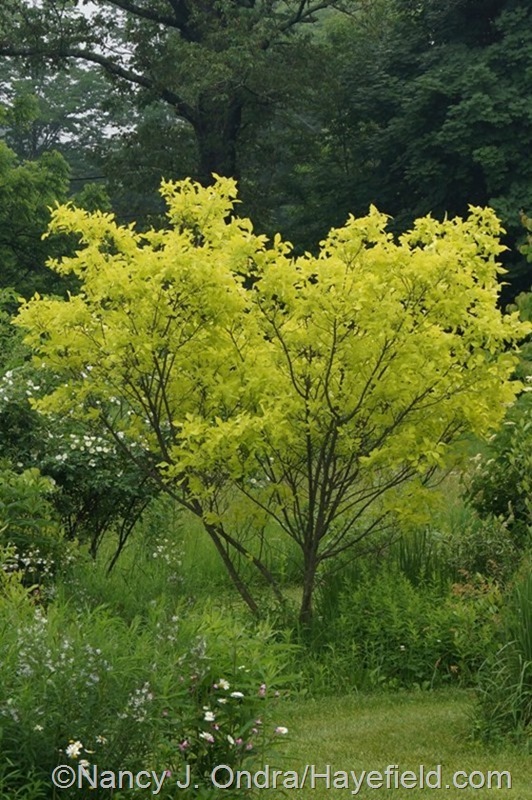 The older leaves eventually turn green, but there is always some yellow at the tips. 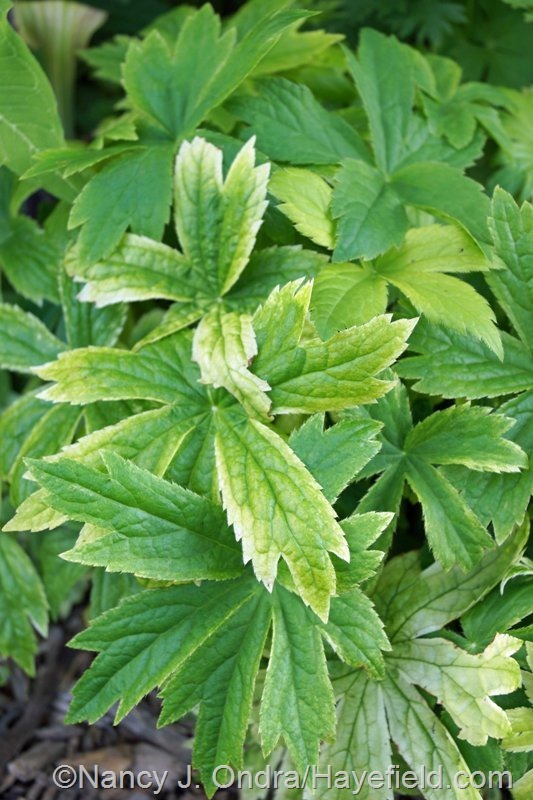 I wouldn’t intentionally sow seed of ‘Sunningdale Variegated’ masterwort (Astrantia major) expecting to get the distinct creamy yellow leaf edges of that selection. But sometimes I forget to deadhead it, and then it produces some rather interesting seedlings. 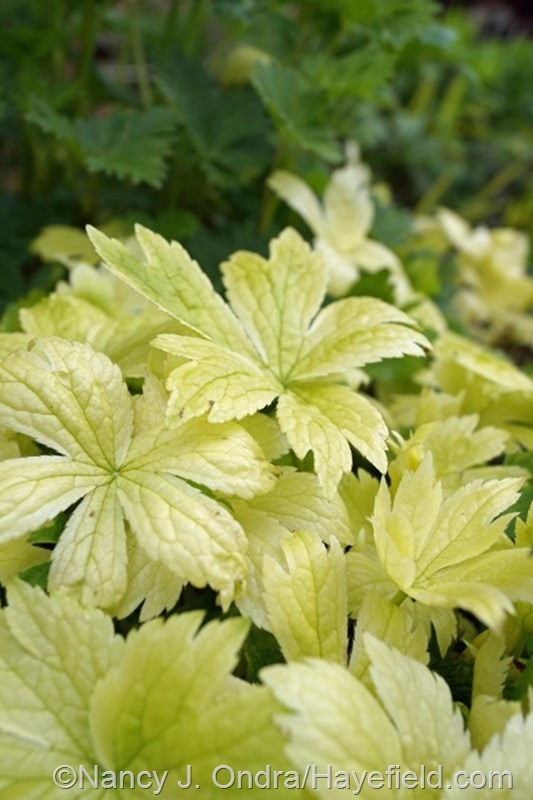 They emerge a solid pale yellow (as on May 9th, above), then age quickly through cream-frosted green (below on May 25th) . 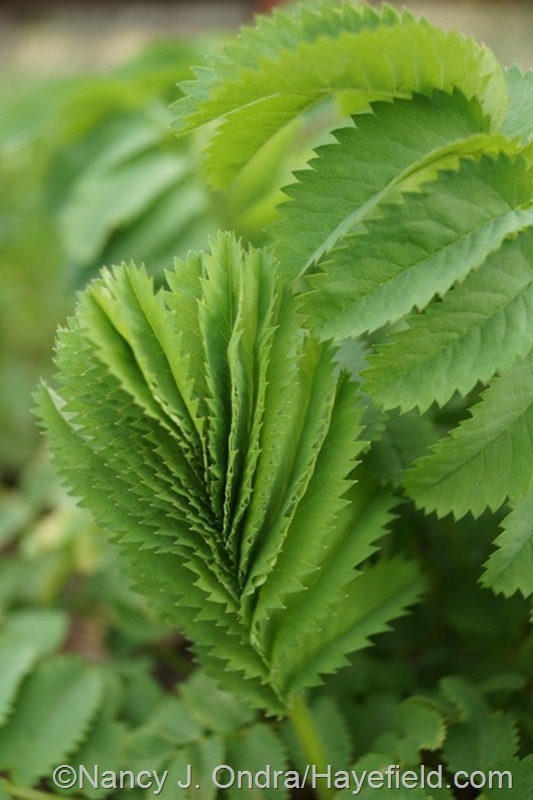 By bloom time, around late June, they are solid green and stay that way for the rest of the growing season. 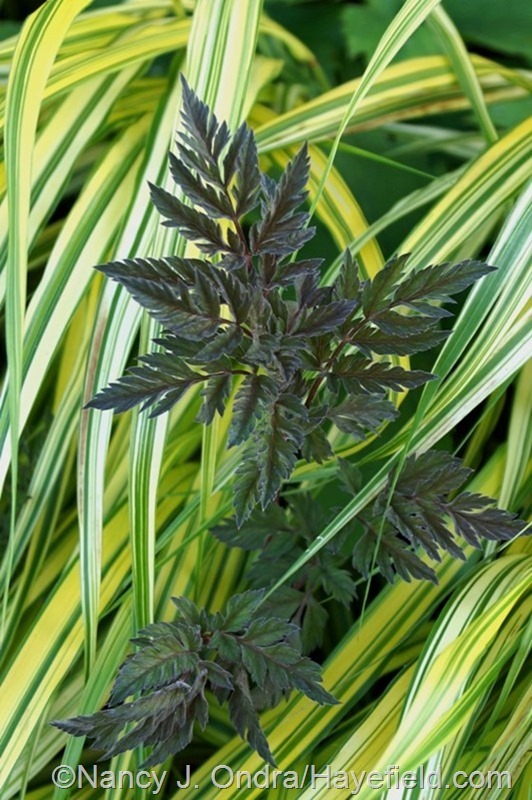 I’ve seen similar plants sold as ‘Sunningdale Gold’. 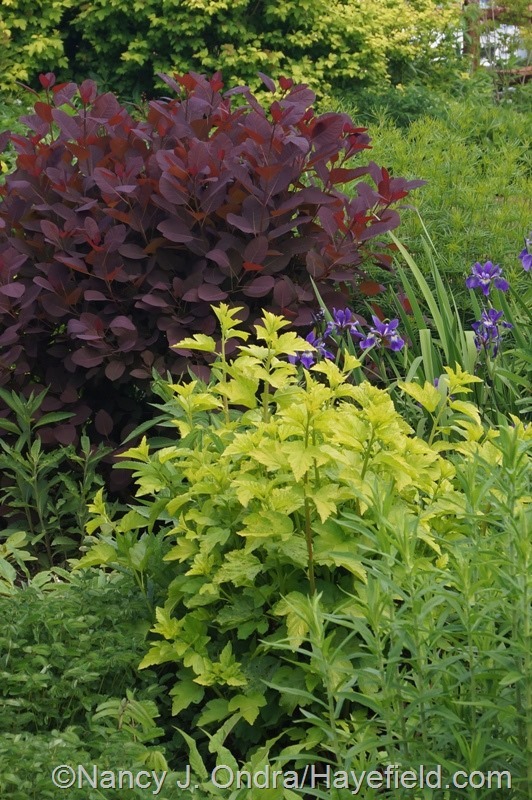 Above is the new growth of ‘Dart’s Gold’ ninebark (Physocarpus opulifolius) on June 6th, against ‘Grace’ smokebush (Cotinus), about 2 months after being cut back in April (down to about 8 inches for the ninebark and about 2 feet for the smokebush). 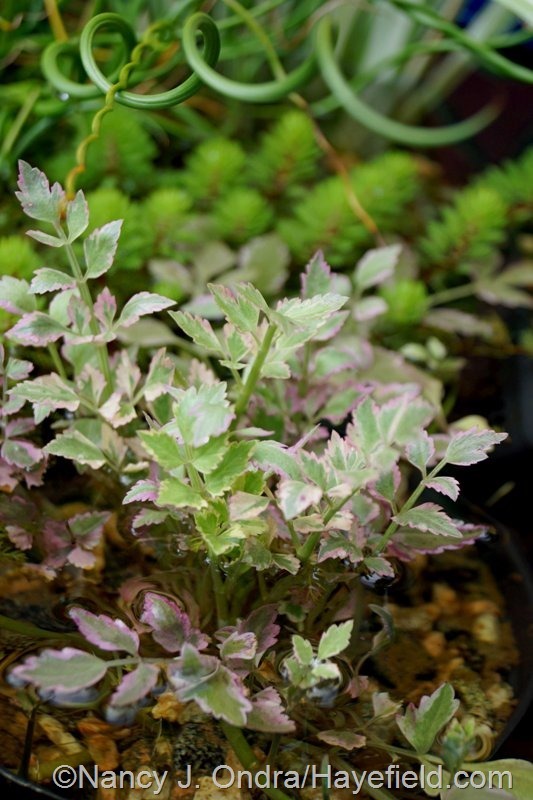 Above is ‘Rocknoll Rosette’ hens-and-chicks (Sempervivum tectorum), and below is ‘Circus’ heuchera, both on May 12th. 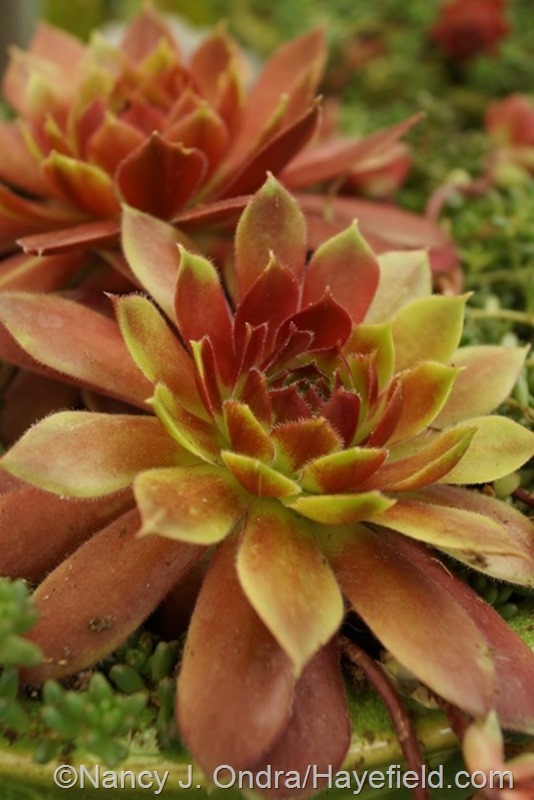 The hens-and-chicks is now more red, while the heuchera now has less red veining. Above are some new shoots of Serious Black clematis (Clematis recta ‘Lime Close’) on April 28th; below, still holding its color as it’s getting ready to bloom, on May 23rd. Above is ‘Black Truffle’ cardinal flower (Lobelia cardinalis) on June 25th, against ‘Isla Gold’ tansy (Tanacetum vulgare). Below is ‘Ravenswing’ cow parsley (Anthriscus sylvestris) on May 31st, coming up through golden Hakone grass (Hakonechloa macra ‘Aureola’). 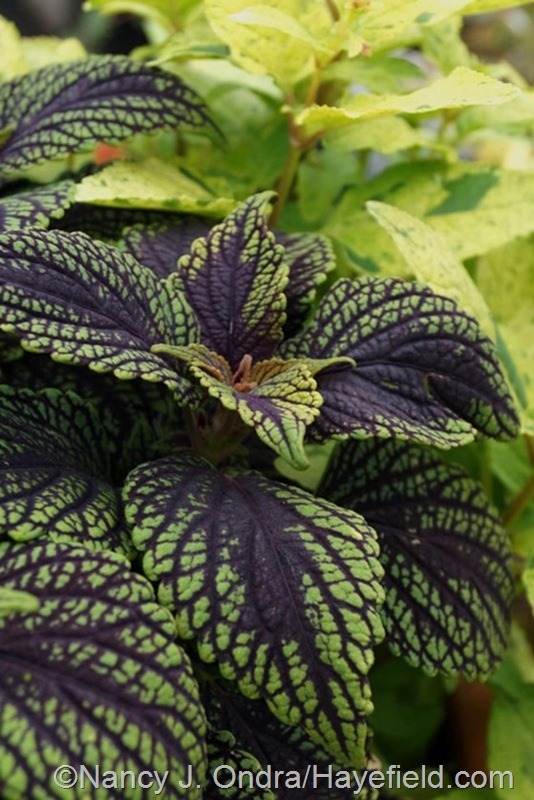 Above is ‘Abbey Road’ coleus (Solenostemon scutellarioides) on June 9th, looking pretty much the same way it’s looked since I bought it in April. Below is ‘Erica’ Culver’s root (Veronicastrum virginicum) on May 12th. The foliage isn’t nearly as dark now, but it still has a purplish cast. Above, a patch of penstemon on May 29th. 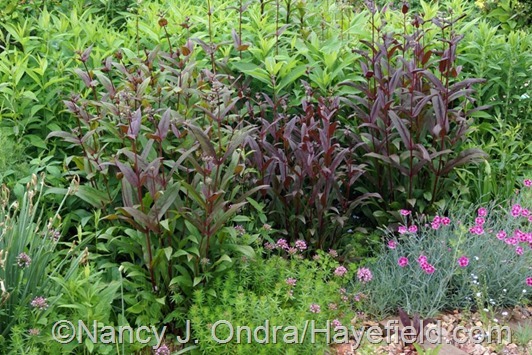 The clump in the center is my original plant of Penstemon ‘Dark Towers’; those around it are some of its seedlings. Below are two younger seedlings from ‘Dark Towers’, on May 25th of this year. As you can see, they can range from bright green to super-dark. Above is ‘Red Majestic’ contorted hazel (Corylus avellana) on June 24th. 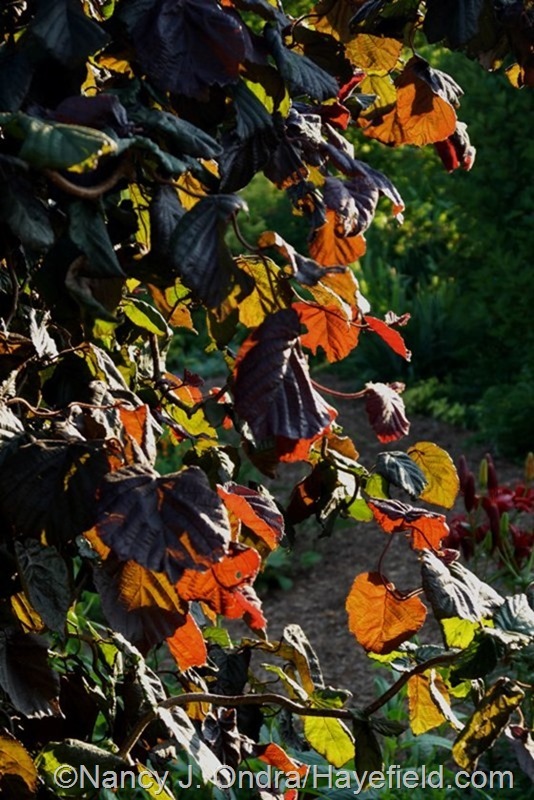 It’s now starting to turn from its spring deep purple to its summer greenish purple, but the shoot tips still have burgundy leaves that are beautiful when backlit by the setting sun. 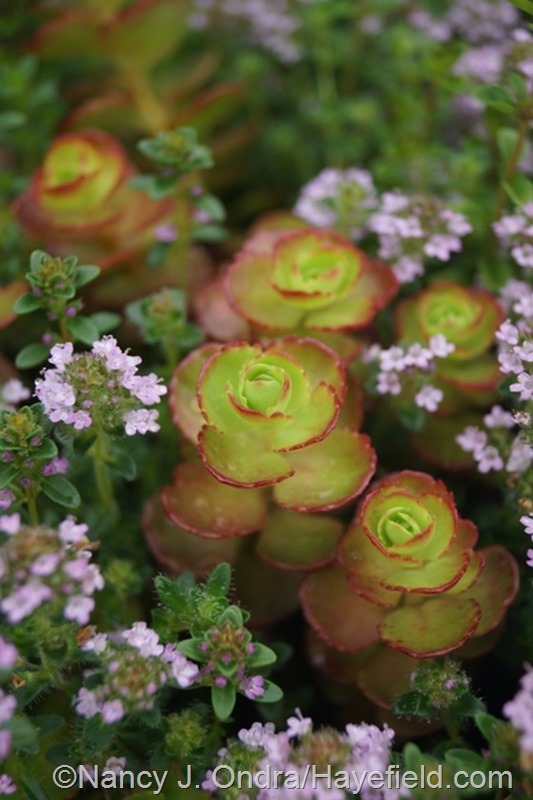 Below, ‘Elizabeth’ two-row sedum (Sedum spurium) on June 9th, with creeping thyme (Thymus praecox Coccineus Group). 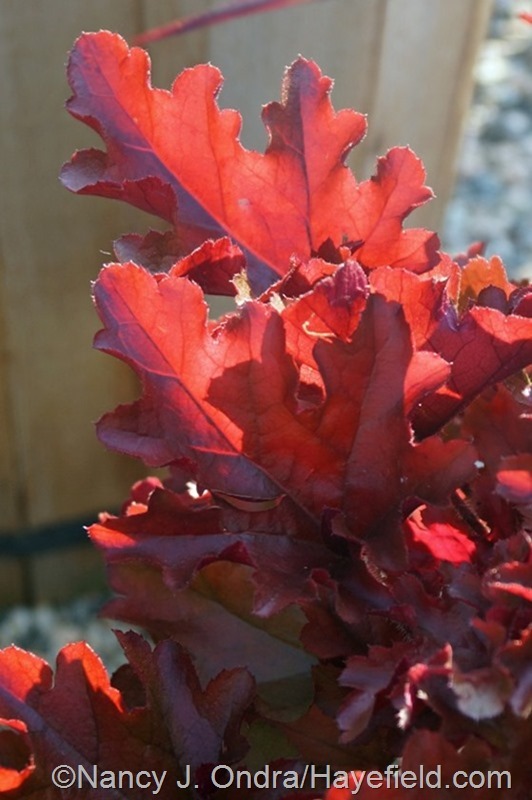 In fall and winter, ‘Elizabeth’ is nearly solid red; in spring and summer, it’s light green rimmed and blushed with red. 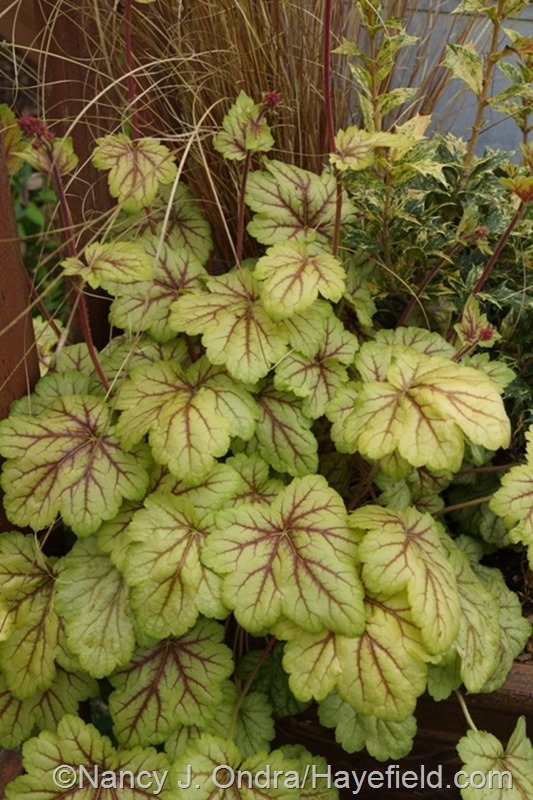 Below, one more red: Dolce Cinnamon Curls heuchera on June 24th. So far, it’s held its rich red color beautifully. It’ll be interesting to see if that continues once we really get some heat. 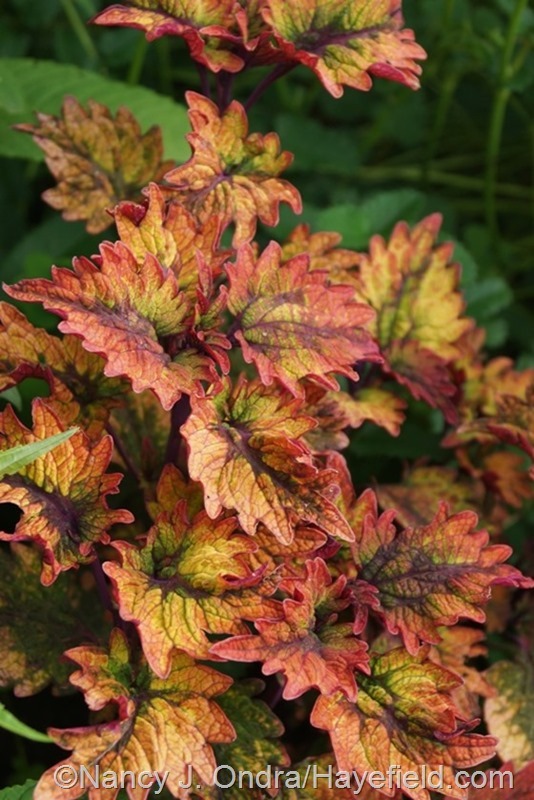 It’s hard to figure out what color category these coleus fall into, with the pink and yellow and green in each leaf, but they generally have a peachy to orange cast from a distance. Above is ‘Limon Blush’ and below is ‘Smallwood Driveway’, both on June 21st. 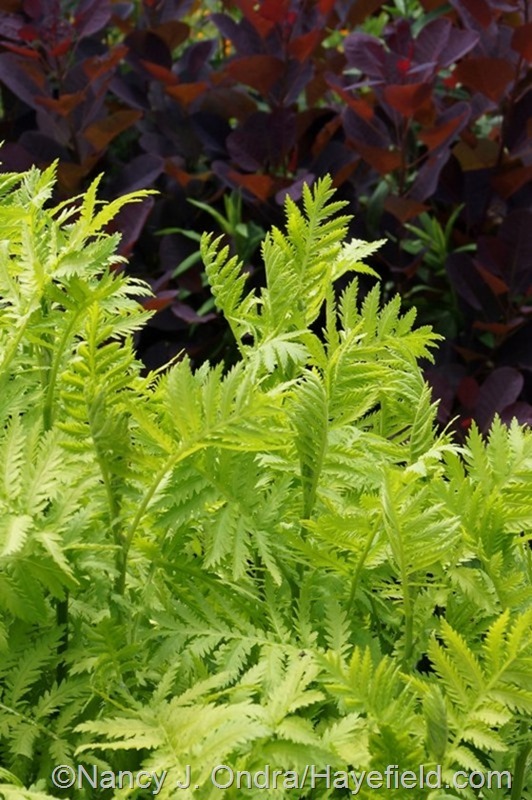 Two more oranges: above, the new growth of autumn fern (Dryopteris erythrosora) on May 14th; below is ‘Southern Comfort’ heuchera against golden meadowsweet (Filipendula ulmaria ‘Aurea’) on May 23rd. 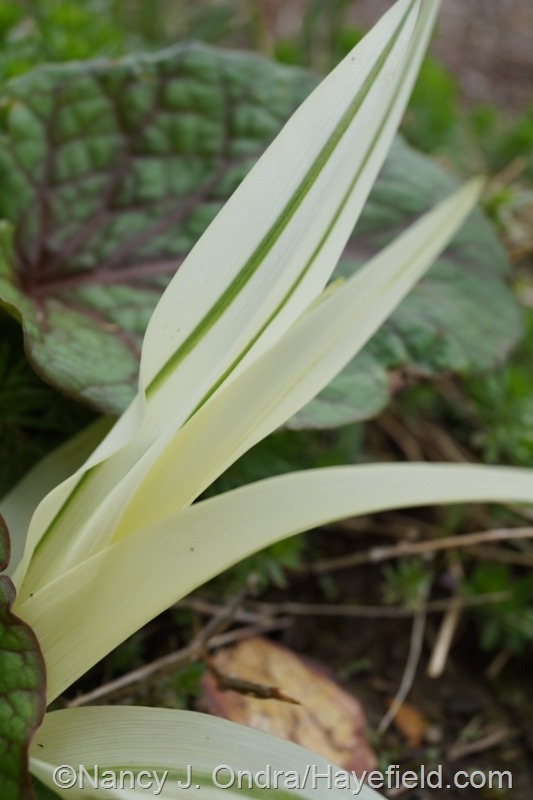 It’s pretty easy to spot the young leaves of Himalayan lily (Cardiocrinum cordatum). 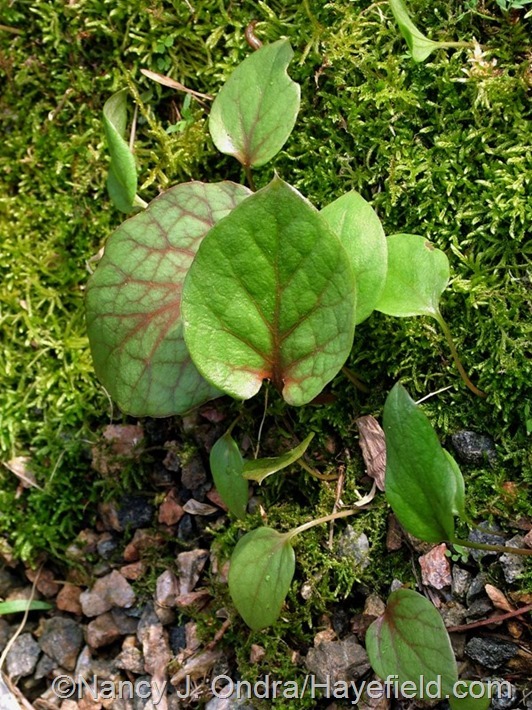 …many of the seedlings (such as these on April 21st) have at least a bit of color. 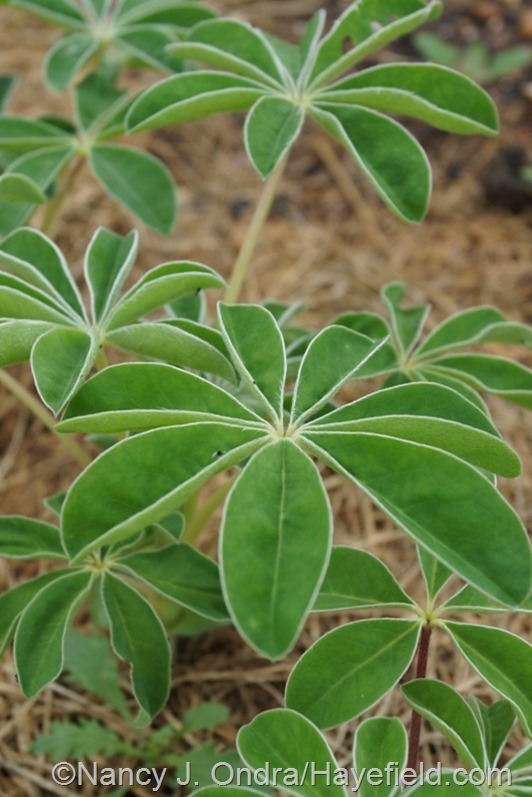 …and the young leaves of sweet white lupine (Lupinus albus) on May 29th. 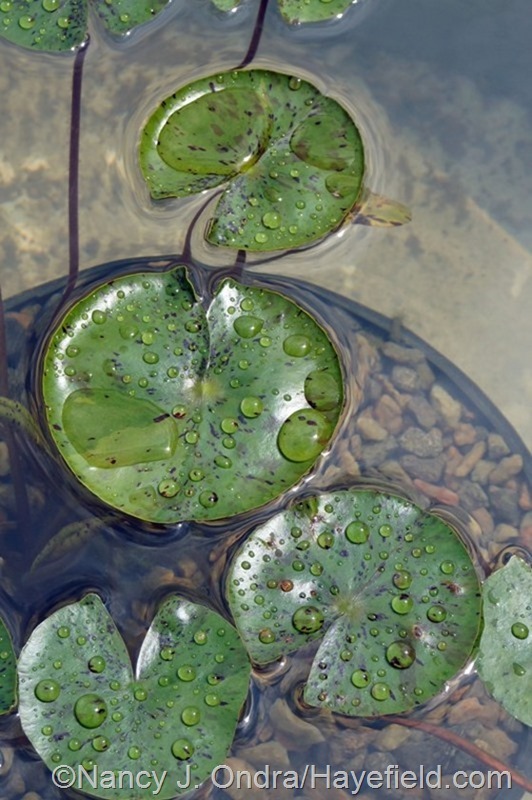 …but they’re smooth and definitely green later in the season. The shot below is from May 26th, as the flower stalks were starting to shoot upward. 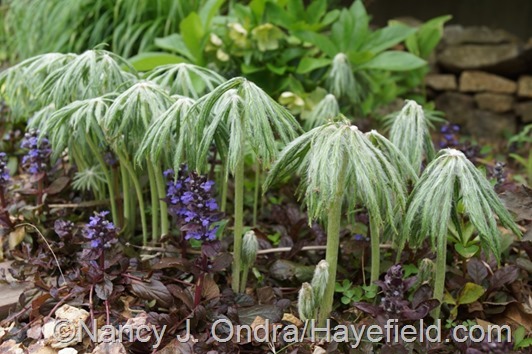 Above, a consistently silvery combination: ‘White Nancy’ deadnettle (Lamium maculatum) with Chinese wild ginger (Asarum splendens), shown on June 26th. 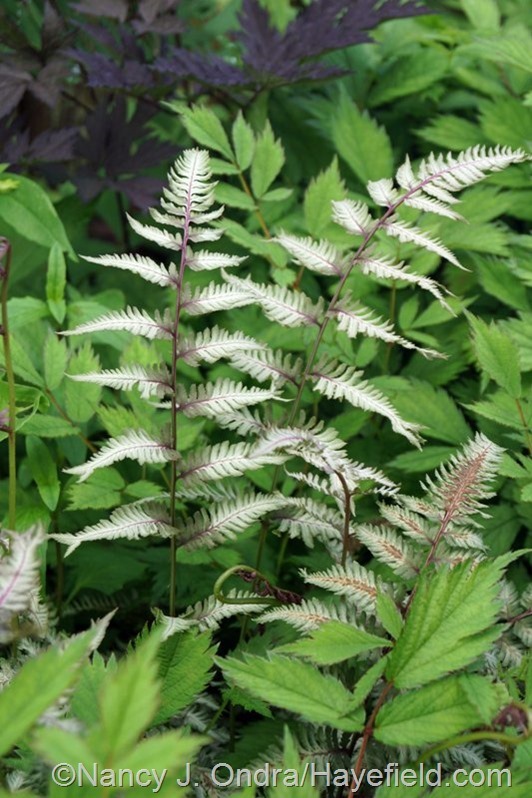 Below, ‘Pewter Lace’ painted fern (Athyrium) with the foliage of dwarf Chinese astilbe (Astilbe chinensis var. pumila) on June 13. Above, silvery green rosemary willow (Salix elaeagnos subsp. angustifolia) out in the meadow on June 13th. 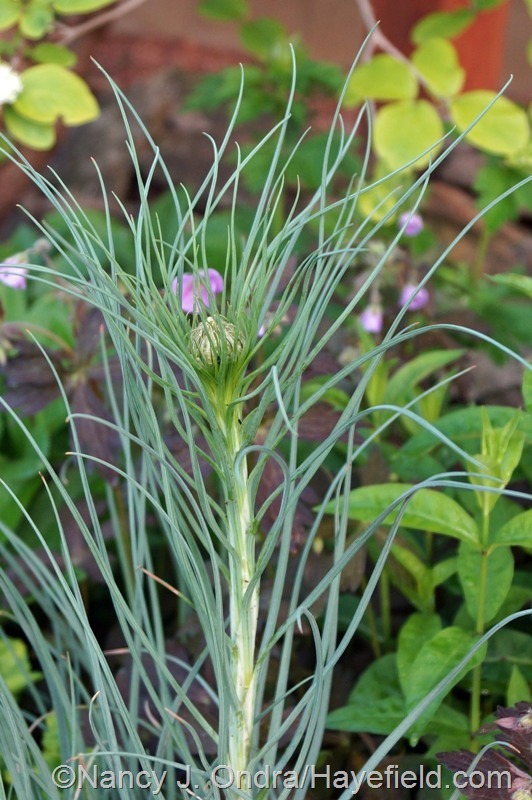 Below, king’s spear (Asphodeline lutea) in the garden, heading into bloom on May 13th. 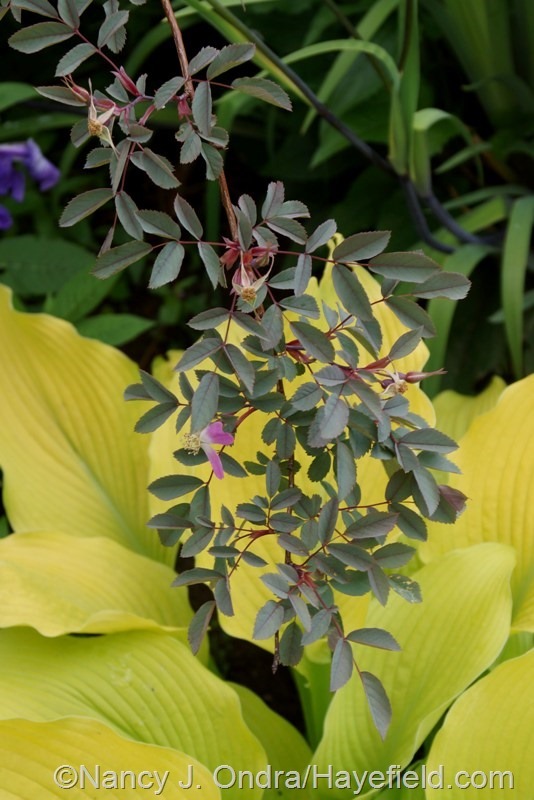 Sometimes you’ll see the common name of Rosa glauca as red-leaved rose, but for most of the growing season, blue-leaved rose makes more sense. 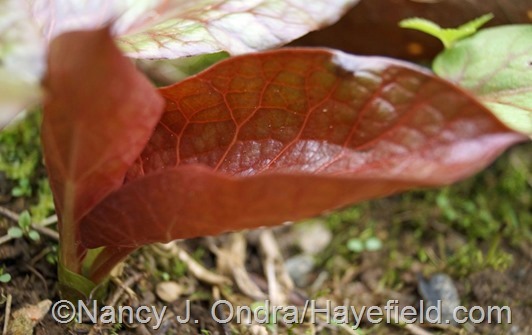 Below it’s shown on June 5, against the foliage of ‘Sun Power’ hosta. 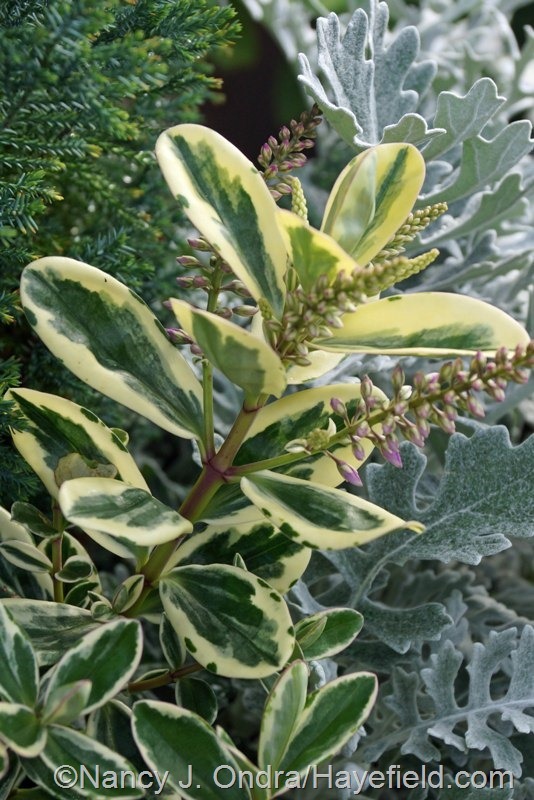 I’ve saved some of my favorites—the variegated plants—for last. Above, green-speckled ‘Lemon Spritzer’ cape fuchsia (Phygelius x rectus) on June 6th. Below, ‘Maculata’ greater periwinkle (Vinca major), with irregular chartreusey patches, on May 12th. 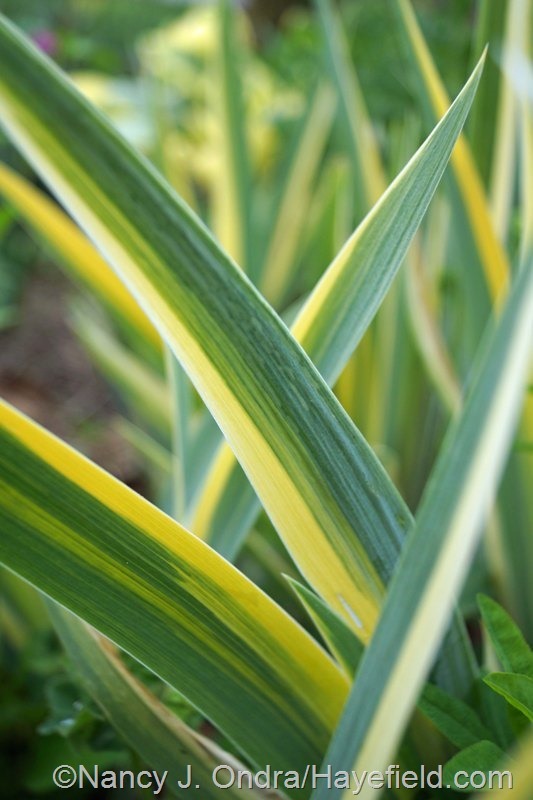 Above, variegated sweet flag iris (Iris pallida ‘Variegata’), with varying amounts of light green, blue-green, cream, and yellow in each leaf, on May 12th. 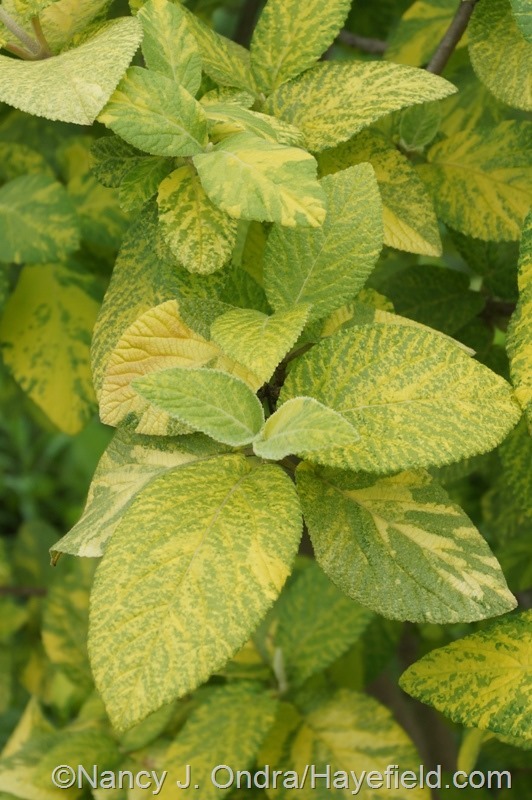 Below, variegated wayfaringtree (Viburnum lantana ‘Variegata’) on May 29th. It’s hard to say whether this one is green with yellow markings or the other way around. 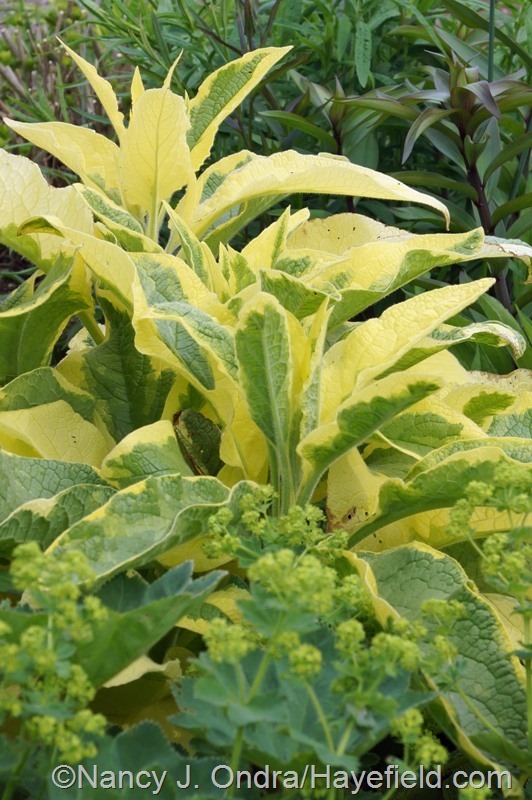 Two more green-and-yellow variegates, both in the herb category…above, golden sage (Salvia officinalis ‘Icterina’) with common thyme (Thymus vulgaris) on May 25 ; below, ‘Axminster Gold’ comfrey (Symphytum x uplandicum) with lady’s mantle (Alchemilla mollis) on May 20th. The sage tends to look good all through the growing season, and even through winter in many areas. At its best, the comfrey is exquisite, but it’s also very susceptible to scorching, and the browned leaf edges can really detract from the overall beauty. 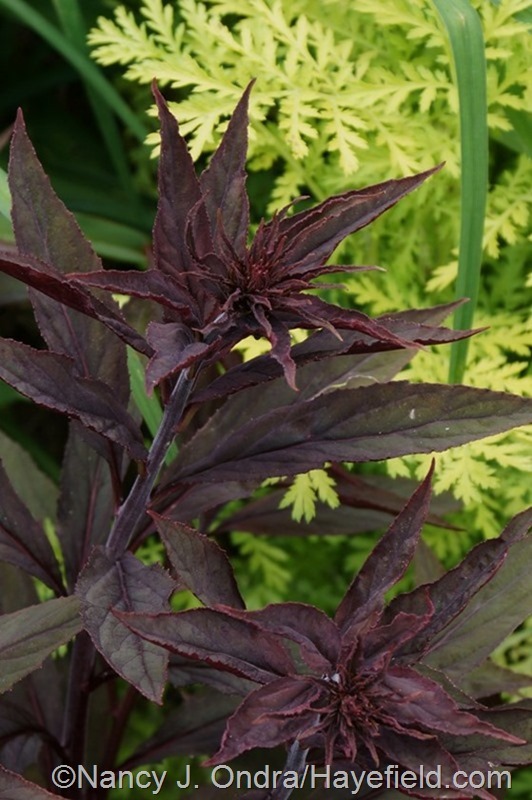 I cut the whole plant to the ground once the flowers finish (in mid- to late June), which gets rid of the damaged foliage. 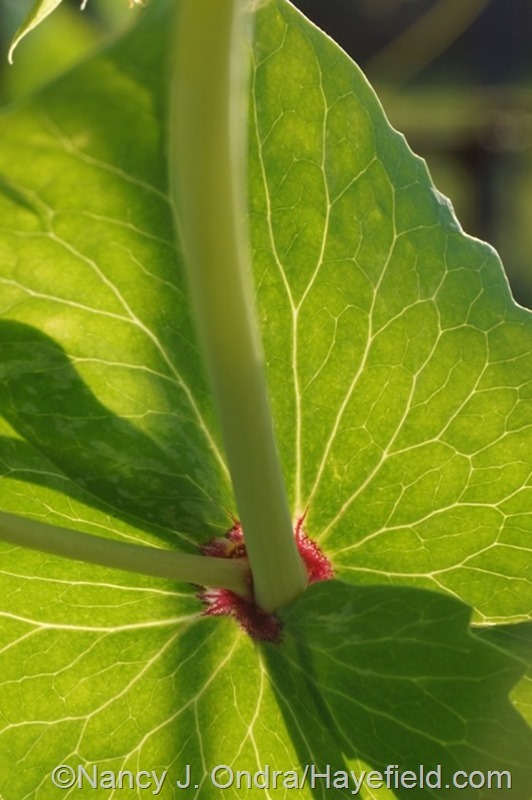 The new leaves tend to be thicker and much less prone to scorching, so they’re good for the rest of the growing season. 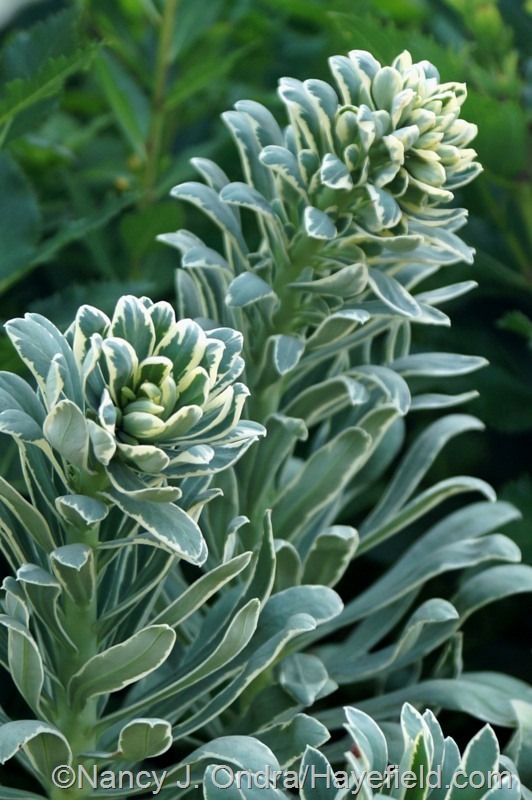 Moving on to the cream-to-white variegates…above is variegated hebe (Hebe speciosa ‘Variegata’) on June 21, just as it was getting ready to flower; below is ‘Glacier’ Mediterranean spurge (Euphorbia characias) on June 25th. Neither one of these is hardy here, but I occasionally indulge in them for containers. 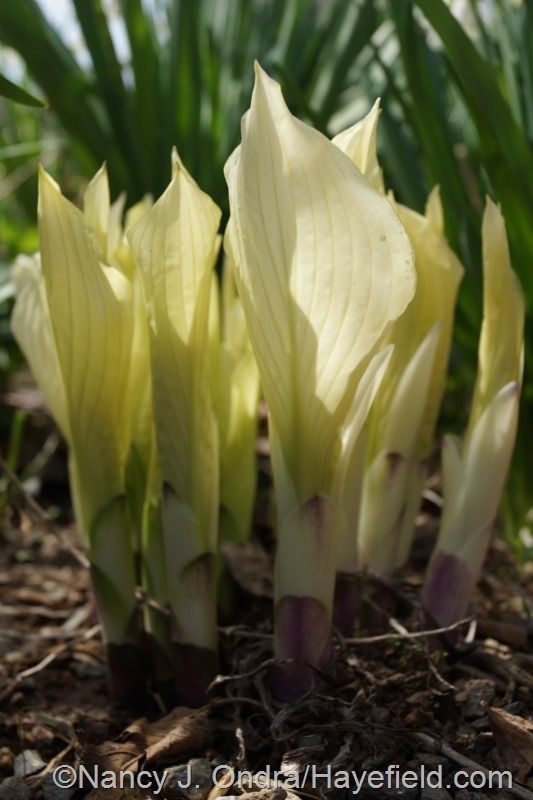 ‘Mostly Ghostly’ hosta is bright white when it emerges every spring (it’s shown above on April 28th) and stays that way for a while; the cooler the weather, the longer the white lasts. 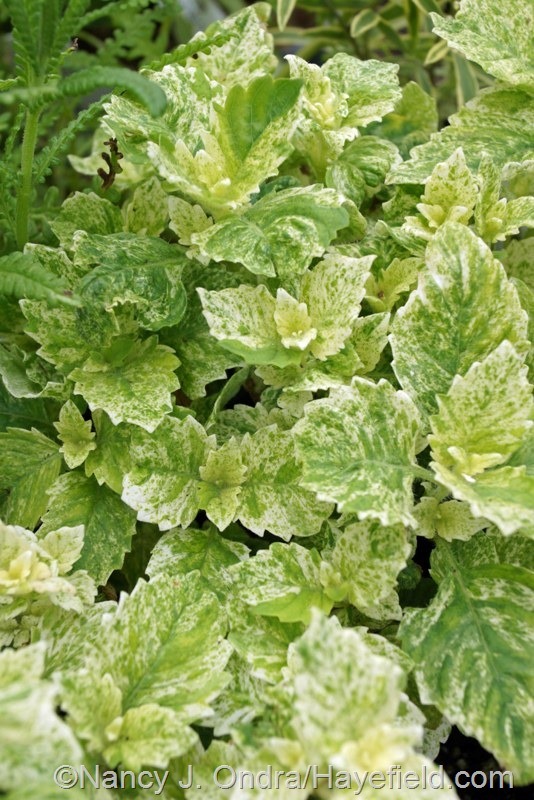 At some point in May (the photo below is from May 29th), green speckling and veining is obvious, putting ‘Mostly Ghostly’ firmly in the variegated category. 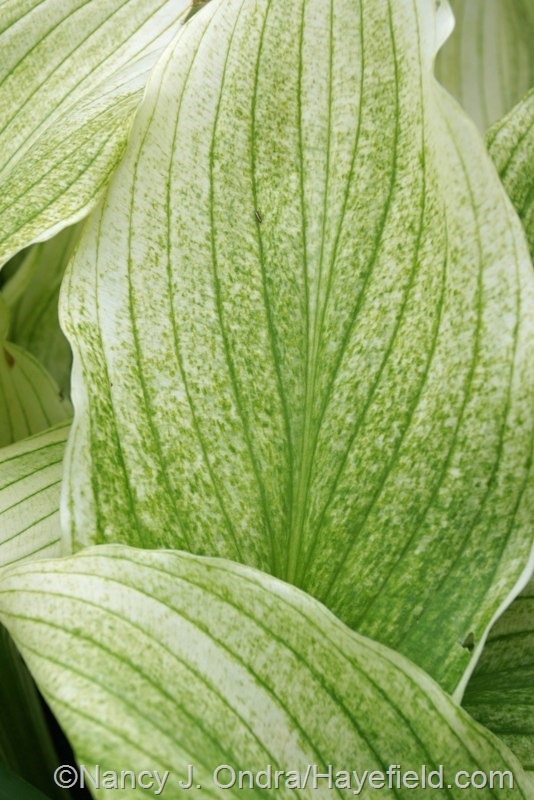 By now (late June), the leaves are mostly light green with paler green speckling, looking very much like a hosta with a bad case of spider mites. But, it’s worth putting up with that for the great spring show. ‘Variegated Kwanso’ tawny daylily (Hemerocallis fulva) is another perennial that can produce practically pure white spring growth. However, very pale shoots like the one above (shown on May 5th) seem to fizzle out after a few weeks. Those with more green, like the one below (on May 12th), are much more vigorous, though not nearly as strong as the practically inevitable all-green fans. Those have to be removed regularly so they don’t crowd out the variegated ones. 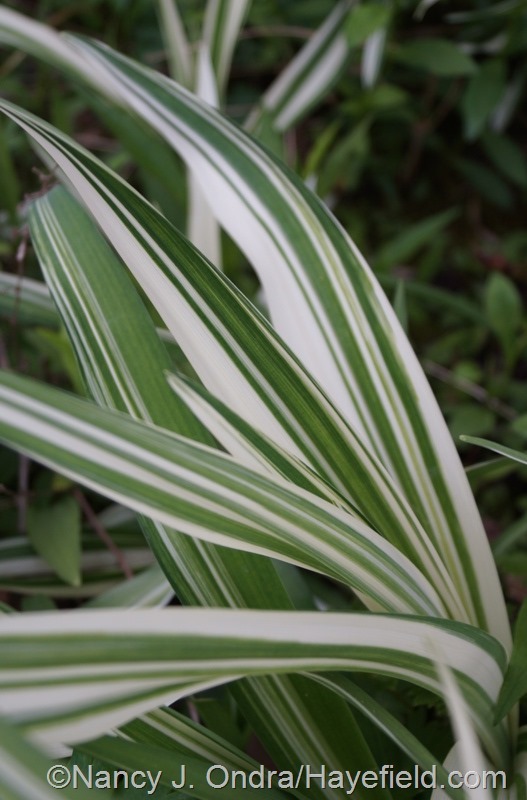 ‘River Mist’ sea oats (Chasmanthium latifolium)—shown below on June 6th—is another beauty for bright white striping. 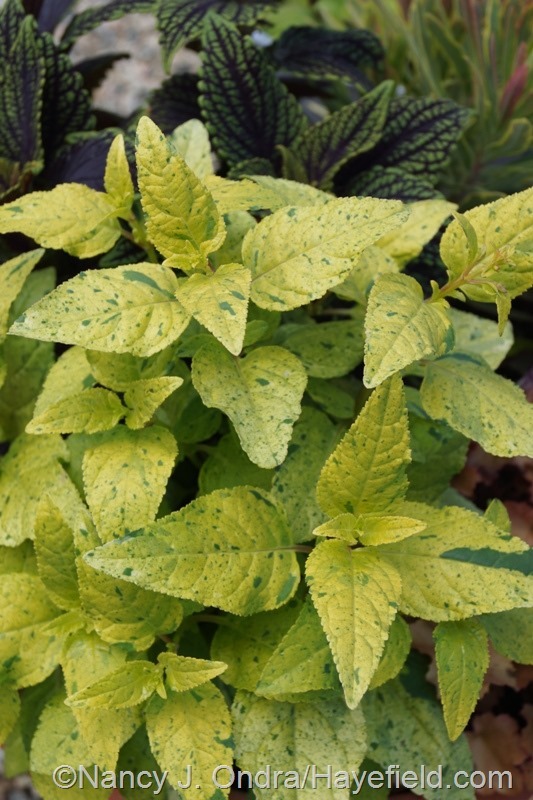 Two more random variegates: above, variegated calamint (Calamintha grandiflora ‘Variegata’), shown on May 12th; below, ‘Flamingo’ water celery (Oenanthe javanica) on June 13th. Above, ‘Hakuro Nishiki’ dappled willow (Salix integra) on June 9th. I normally cut it down to 12 to 18 inches before new growth appears in spring, but I didn’t get around it it this year, so it’s much taller than usual. I like the extra height because the plant’s in better proportion to its shrubby companions, so I may go with every-other-year pruning from now on. 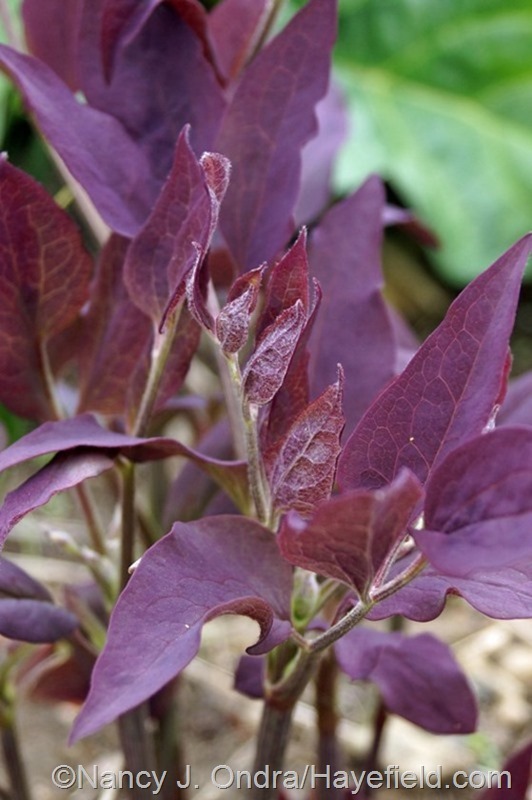 Below is a plant that I got years ago, labeled as Salix integra ‘Goshiki’. I was never quite sure about that, though, so I decided to try to pin down the ID this year. 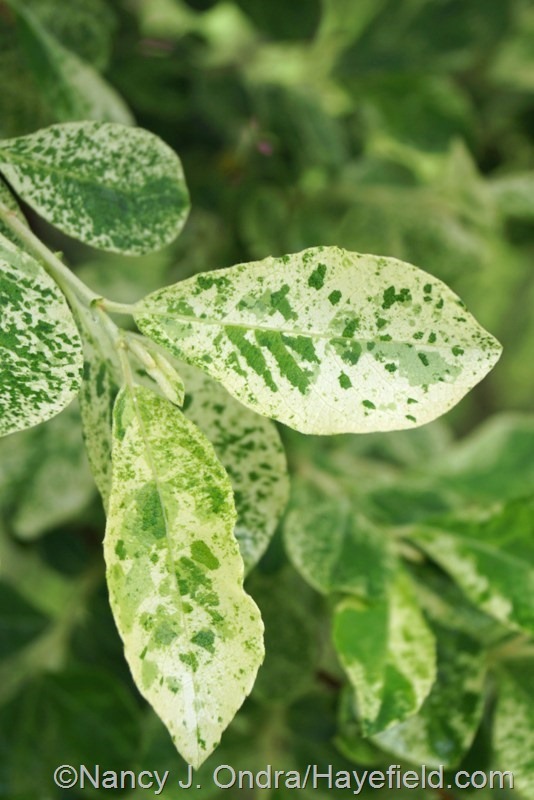 As far as I can tell, it’s actually variegated gray willow (Salix cinerea ‘Variegata’). 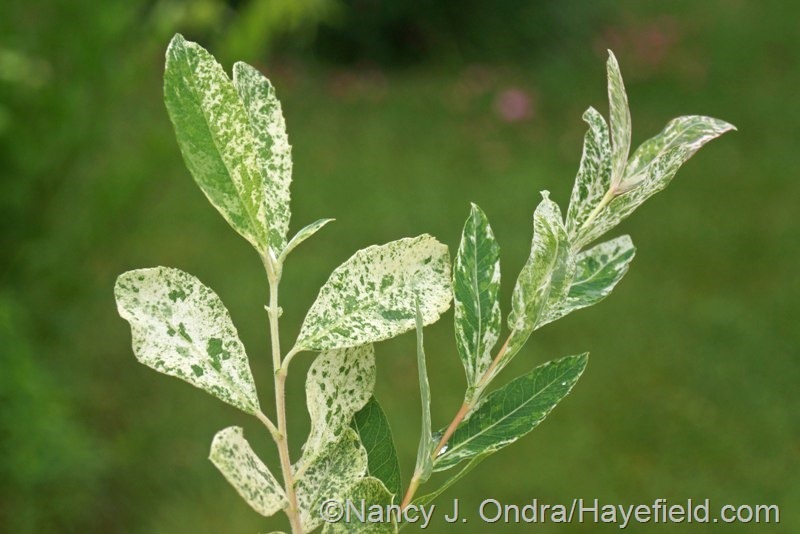 The speckled variegation pattern is similar, but the leaves of the gray willow (on the left below, on June 13th) are distinctly wider than those of ‘Hakuro Nishiki’ dappled willow (right), and they don’t show the pink blush that ‘Hakuro Nishiki’ often does. Both of these willows are hosting a fair number of imported willow leaf beetles (Plagiodera versicolora) this year. I was thrilled to get seeds of ‘Bill Archer’ borage (Borago officinalis) last winter (thanks, Rick!). Each seedling is different, but all six had at least some variegation. The photo above was from June 9th. Rick also hooked me up with seeds of ‘Jade Snowflake’ chinaberry (Melia azedarach) two years ago, and I ended up with three seedlings. Last fall, I dug them up when they dropped their leaves in November, plunked them in a container, and left them in my unheated basement for the winter. I planted them back outside in late April, and the new growth (shown below on May 25th) was spectacular. I expect the foliage to go mostly green soon, as it did last year. 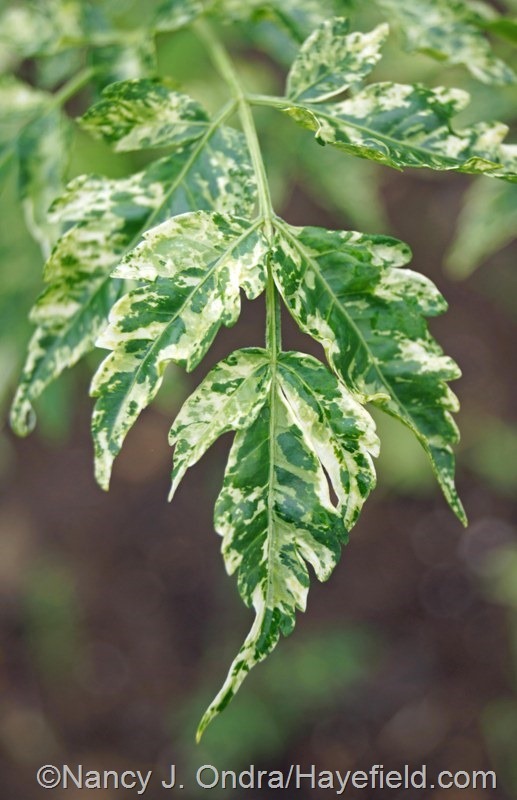 But at this point, the leaves still are as heavily variegated as the one shown below on June 9th. Tired of foliage for now? That’s ok; next up, Bloom Day on the 15th! Good to hear from you, Mary. I’m glad I could add to your list! I love leafs in different colors and in different shapes, so of course I have your book and of course all of the plants I can find here. 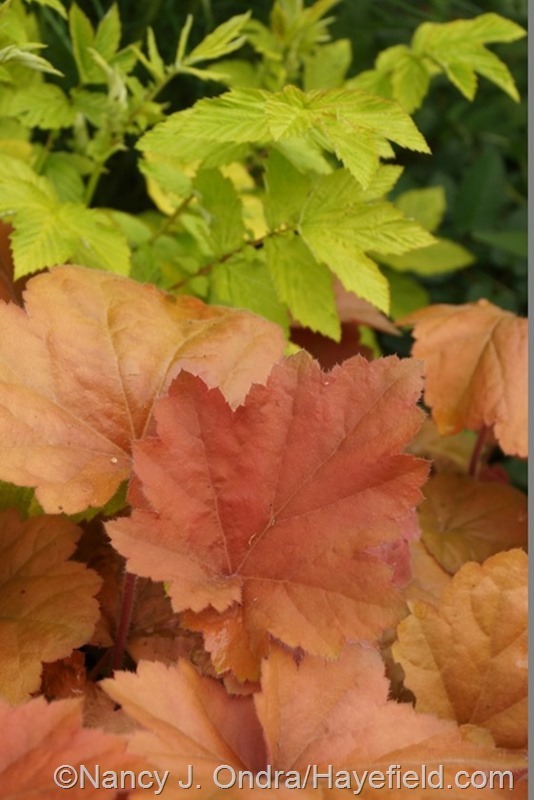 Instead of the Viburnum opulus `Aurea´ I find a redish one, called `Americana´. But…I planted this (together with some other bushes and trees) rather large one last autumn in the new part in our garden, the site we now call “the park”. Then this spring I planted around 30 new trees and large bushes and all of them have survive – except the Viburnum!? So sad…..
Aw, I’m sorry to hear about that, Susie. One loss out of 30 really isn’t too bad, though. I hope you’ll be able to find something wonderful as a replacement. Today my husband noticed that the whole bush was filled with tiny buds!? So I haven not giving up hope for it yet…..
That’s wonderful news, Susie! I hope it leafs out soon and looks lovely for you. I’ve rendered you nearly speechless, huh? Success! Every thing is so pretty. 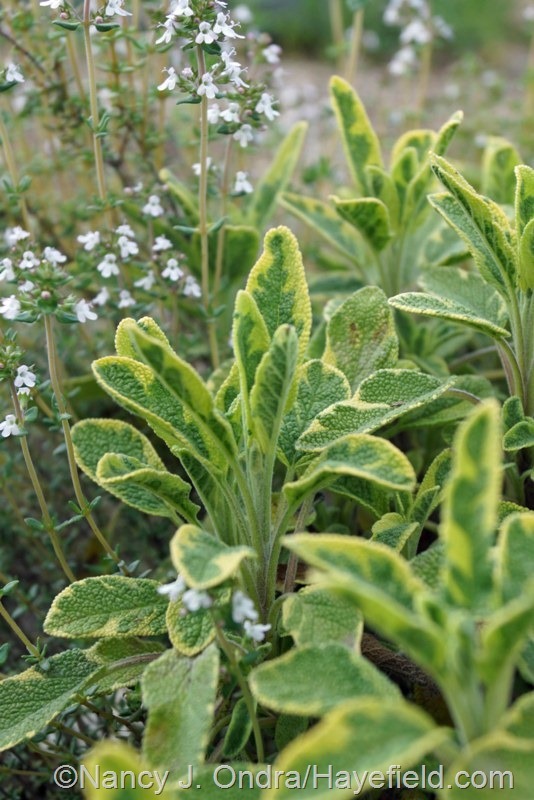 Love the variegated borage and phygelius. The black clematis is pretty cool. 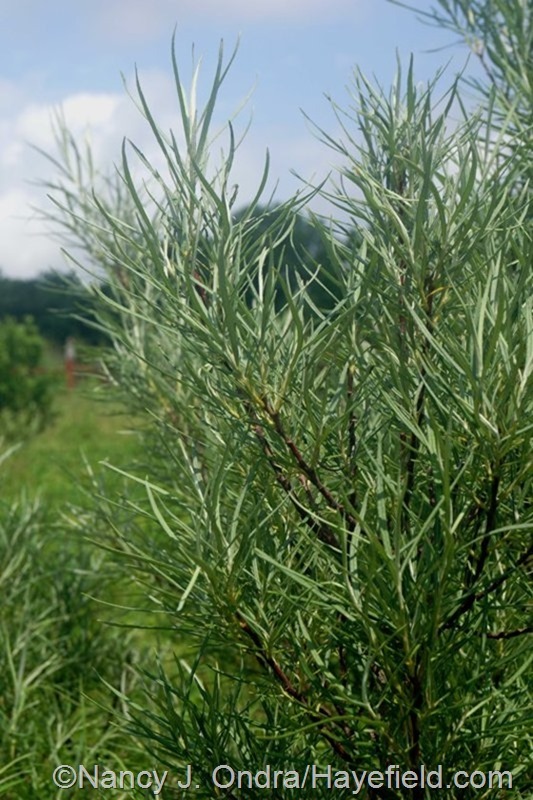 Can the rosemary willow be kept small? Love it. Hey there, Mel. 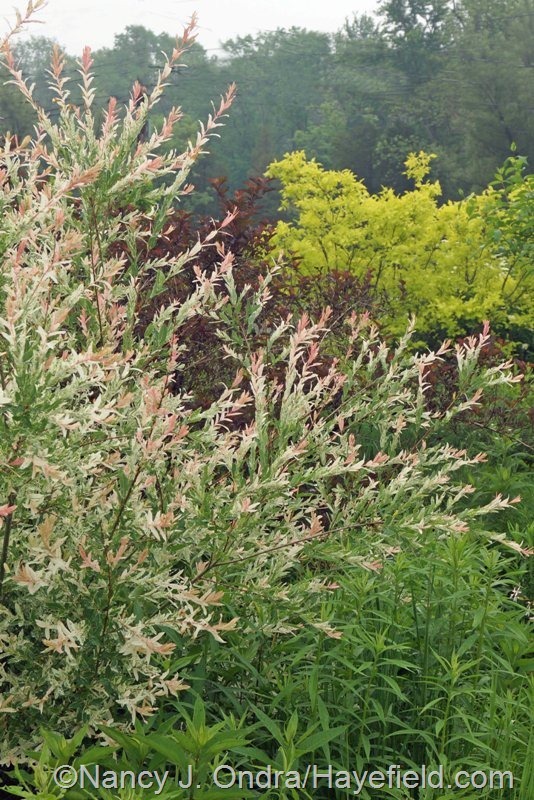 My rosemary willow is around 12 years old and only about 6 feet tall and 4 feet wide. I’ve seen larger ones, though. If you’d like details on how to keep it small, you could consult with the deer around here: they use a regularly applied system of chewing and rubbing on mine. I’m in a suburb of Cleveland, but that doesn’t mean I haven’t seen deer. On Xmas day a herd of them came running down our street. Very strange. My lot is small and there are too many things I want to grow. I’m at the point in my life where I don’t want a bigger piece of property either. What to do…. If it’s not deer, it’s rabbits, or groundhogs, or vandals…all we can do is keep trying! Thanks for visiting today, Crystal! 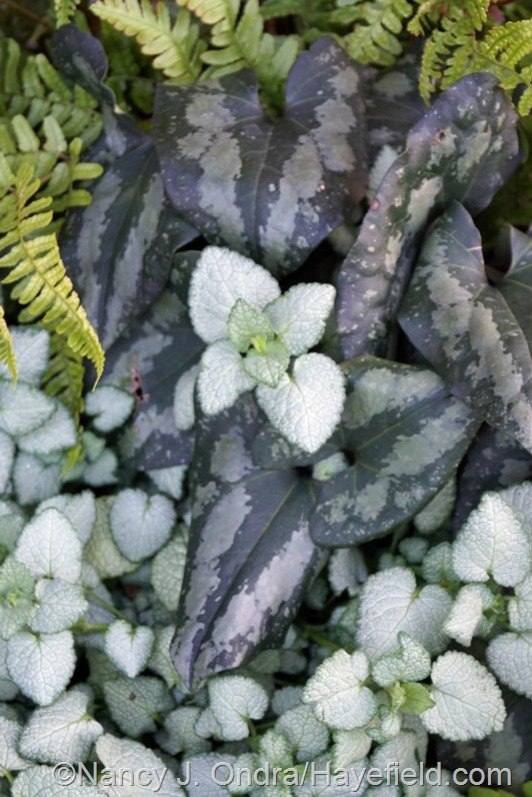 A lovely series of photos, showing that foliage can vary so much and I love the way you combine different plants with different foliage forms and colours, truly amazing! Hi again, Allan. It was fun to finally show off some of this year’s best leaves. I’m glad you enjoyed it too! all so very beautiful..and your climbing asparagus is the biggest I have ever seen, how long have you had it? Hi Cheryl! 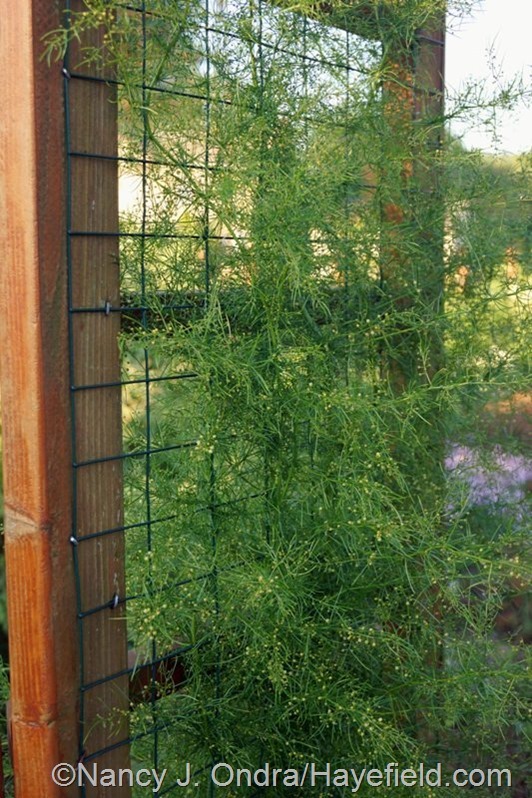 I’ve had the climbing asparagus for about 12 years no. It probably would be larger, but I’ve had to move it in the past, and it sulked for several years after that. It finally picked up again last year and is very happy now. I just wish it would set seed so I could get more; I wouldn’t dare try to divide it and risk killing it. Nancy, you reminded me of lines from a Frost poem–“Nature’s first green is gold/Her hardest hue to hold…” with the varied hues of yellow to red. Always a treat to scroll down the photos. My raised bed garden (thanks to a special sale at Ace Hardware Store) is quite green and I harvested my first yellow summer squash this week! The range of leaf colors is amazing, isn’t it? I hope you won’t be working in your garden too much this week; it looks like we’re in for a real dose of hot and stormy weather in our part of PA! Happy Foliage Day, Christine. Thanks for taking the tour. I hope you’re having fun with the seeds! 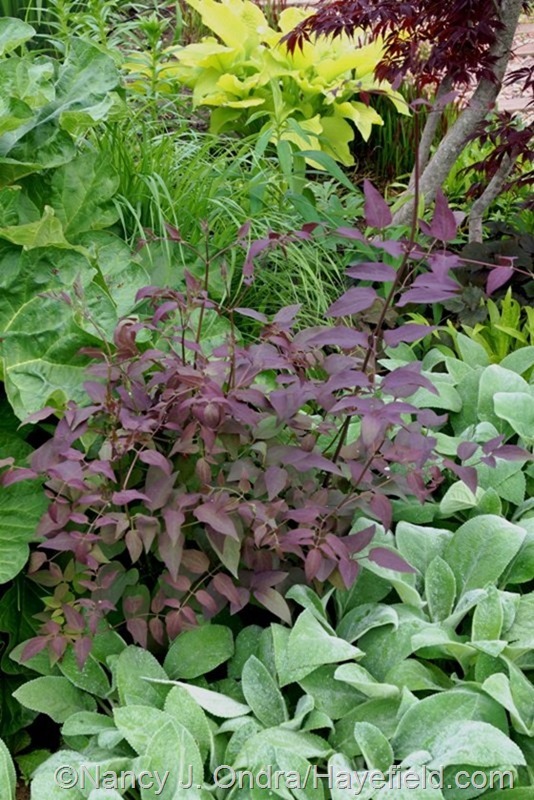 I love variegated and burgundy foliage, you provided a smorgasbord of lovely foliage to consider. Just last night, I noticed a bunch of other foliage favorites that I forget to include, so I guess I’ll be squeezing even more offerings into my next post. There’s a lot going on this time of year. I hope your garden is treating you well so far this summer, Hannah! So beautiful, such a rainbow! The ‘River Mist’ sea oats (I call them “forest oats”) — do they reseed as much as the species (green form)? Are any of the offspring variegated too? I can’t give you a definitive answer about that yet, Alan. I had a bit of trouble getting it established, and it didn’t flower the first two years. It’s just now starting to make flowerheads this year. My guess is that it will reseed but that the seedlings will not be variegated, but I could be wrong about that. 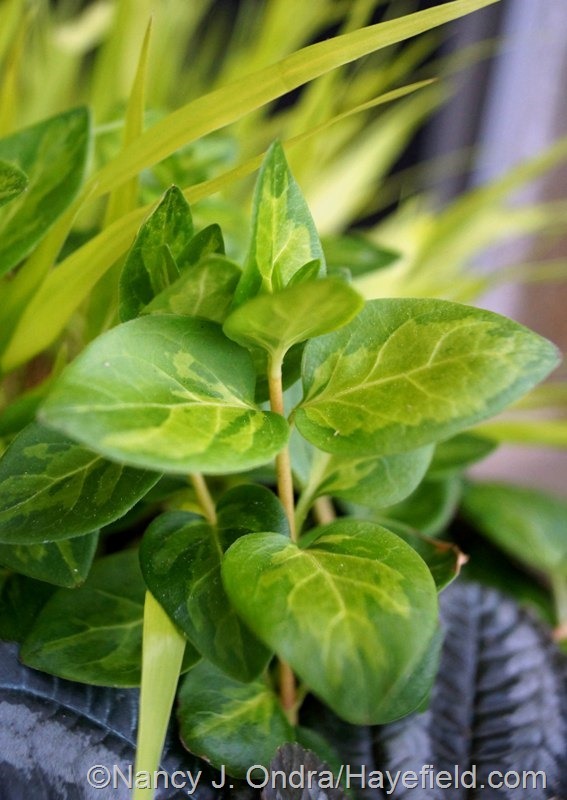 I see that Plant World Seeds is offering the seeds for sale (Chasmanthium latifolium ‘River Mist’), but they don’t claim that the seedlings will be variegated. I guess I will do an experimental sowing this fall if I get seeds from mine. I always love your posts! Your photos are beautiful and I learn so much from you, and see so many plants that I want to try, even tho I don’t have room for anymore. I didn’t know I was to cut my Darts Gold Nine bark back to 8″ in the spring. I will do that next spring. Mine has gotten very large. I received seeds from you last year, and everything has come up but the Dark Towers. I think it gets to much shade wher I put them. Thank you so much for sharing. Very generous and time consuming! Well, think I will look the post again. Happy gardening! Hi Karen! It’s not standard protocol to prune ninebarks that heavily every year. 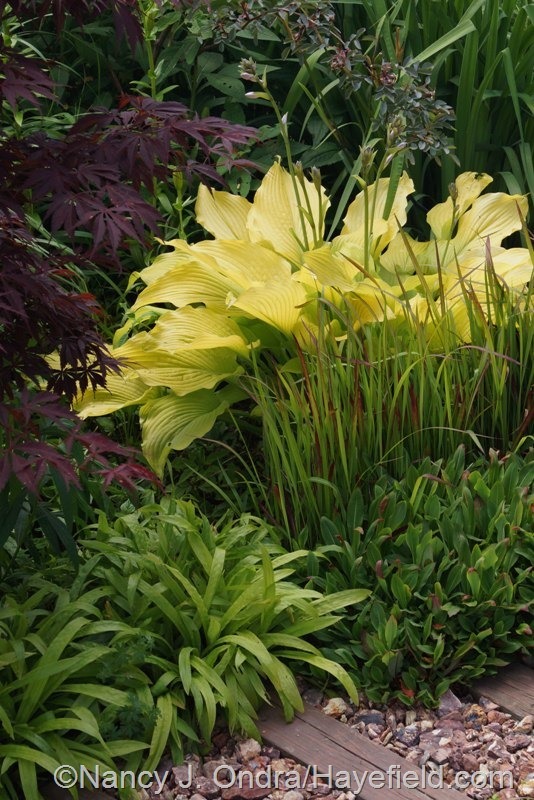 I treat those in the front garden that way to get a specific shape and foliage effect in those borders. However, I do lose the natural form, the peeling bark, and the flowers and seedheads on those plants. (I have others that I let grow without any pruning where space allows.) If yours is well established (as it sounds like it is) and too big for its spot, you could try the hard pruning before new growth starts next year and then leave it alone for a few years to let it bush out again. And thanks for letting me know about your success with (most of) the seeds! As usual amazing photos and beautiful combinations, I don’t know how you manage both plus put it all together in a single post. I love the sedum and thyme picture, I never considered thyme to be photogenic before but it also makes the sage photo special. Thanks for the ninebark idea, I’m going to try cutting my dart’s Gold back too. This spring I thinned it a bit and like the look, maybe next year the whole thing will get a whacking. Hope you and the guys stay cool this week! Hey, Frank; thanks for visiting again so soon. Keep in mind that this is three full months’ worth of foliage–though I’ll admit that I did have lots more that I *could* have included (figured I’d save some for winter posts). I’m getting a bit nervous about the fate of my readers’ ninebarks, but really, they do seem to put up with the tough-love treatment. The boys are holding up all right so far: one’s currently settled in front of the barn fan and one is sprawled out in the shade house. We’ll see how the rest of the week goes. I do hope we get some of the rain we’ve been promised, though not the severe weather! Glorious photos as always, Nan. And the endless variety of the garden never ceases to amaze. Thanks so much for sharing–lots of ideas and inspiration from your posts! Great to hear from you, Nora. I’m so glad you enjoyed the spin through the season’s foliage highlights to date. I hope all is going well with your garden so far this season! Hi Nan, Wonderful photos of foliage! Can you tell me the lily variety that is in with the Axminster Gold comfrey shot? Does it keep its purple hue? Thanks for all the great combination ideas, as usual! That’s a good question, Donna. I had to go out and look because I didn’t remember planting any lilies there. The nearest I can figure, they are the Orienpet lily ‘Anastasia’ I planted 4 years ago and have not yet seen bloom. I’ll know for sure once they flower in a few weeks. 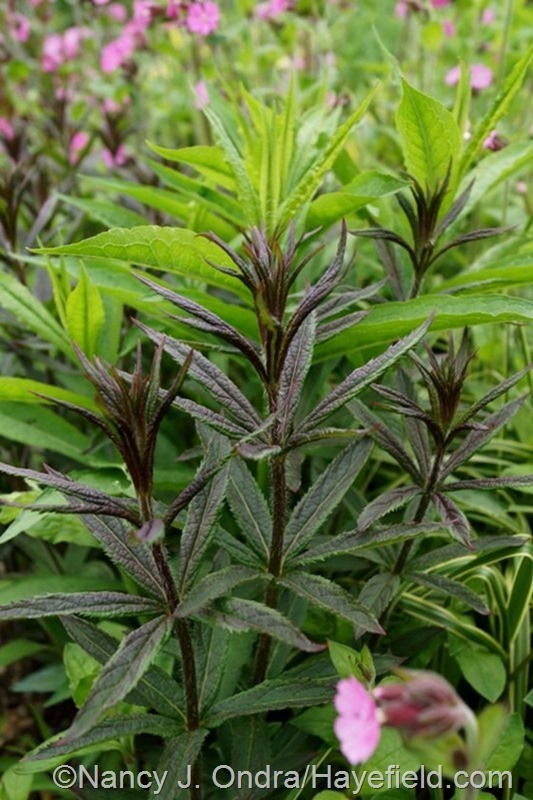 They’re aren’t particularly purplish now but do have a bit of dark blush on the stems and young buds. As beautiful as any Bloom Day post, Nan! You’ve certainly shown the value of giving attention to foliage selections. That Serious Black Clematis is the darkest I’ve ever seen in that genus. 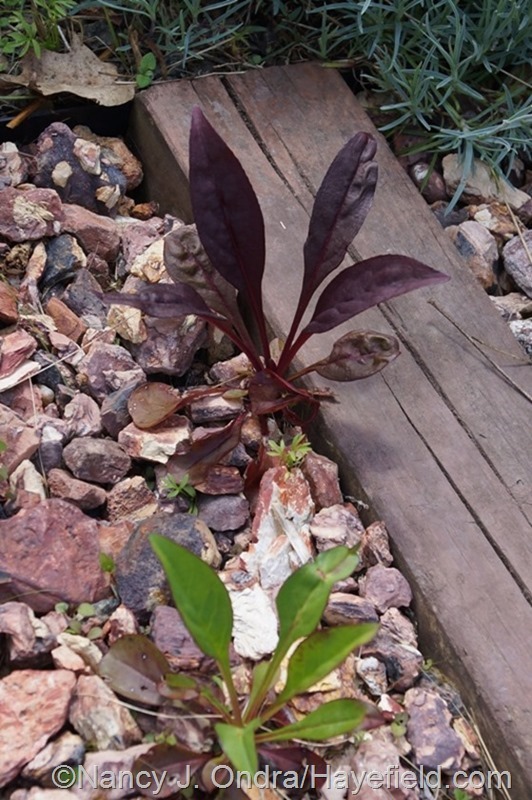 I’ve become increasingly fond of the contrast between lime and bright green foliage and the darker foliage colors with each passing year myself; however, my choices for my Southern California garden depend heavily on drought and heat tolerant plants, like Phormium (‘Dark Delight’ and ‘Amazing Red’), Leucadendron (‘Ebony’) and Coprosma (‘Plum Hussey’ and ‘Evening Glow’). My favorite variegated plant, for now at least, is Abelia x grandiflora ‘Kaleidoscope,’ which blends lime green, yellow and orange tones. Oh sure, Kris, taunt me in return with lovely foliage plants that I can’t get, let alone grow successfully. 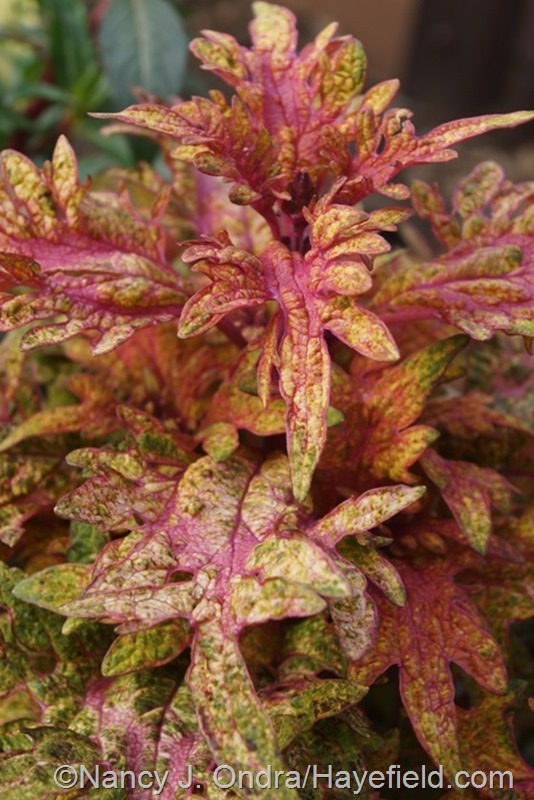 I agree with you about the amazing coloration on ‘Kaleidoscope’ abelia, but I’ve never had much luck with that one, either. It should be hardy here, but it usually fizzles out after a year or two and never fills out to look like much. Oh well; lots of other gorgeous plants to grow! Love the photos on your blog. 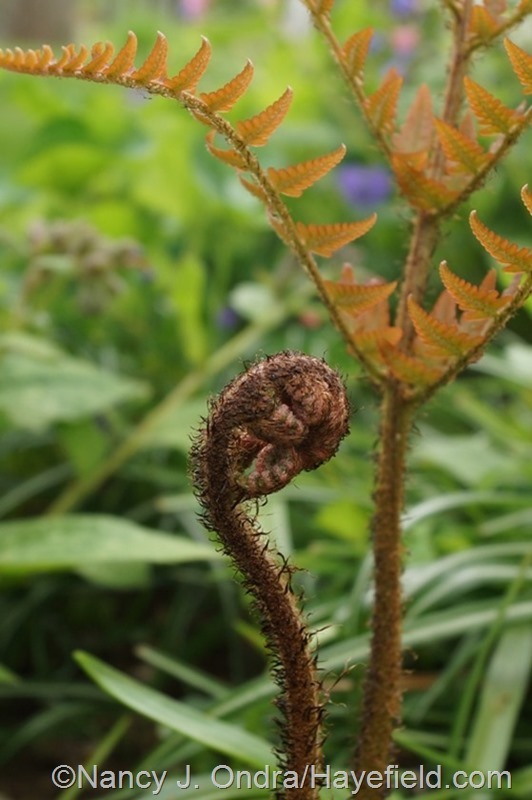 I found two wonderful plants I think would go very nicely in my garden…I really appreciate the walk through your garden to look at what is in-bloom and what is doing nicely. I am so pleased to hear that, Charlie. After a while, running across just *one* new plant is a thrill, so your finding two here is terrific. If you have trouble finding them, feel free to get in touch and I’ll help if I can. Also, let me add some reassurance about ninebarks. I had terrible mildew on my Gold Dart one year, and also on a Coppertina in a crowded position nearby. I cut both of them to the ground and kissed them goodbye. A month later they both had beautiful new shoots up, and the next year they were stunning. And no more mildew since then (knock on wood). I also have a Diablo out by the road that I now cut down every 2 to 3 years to keep its size manageable, and it does fine. And a Diablo I have in my red berm actually sprouted from some of these cuttings that I piled there and then buried under some other cuttings and sod. So I think ninebarks are incredibly tough, as well as being beautiful. Right now is my favorite time of year for Diablo; those red seed heads are so stunning against that dark foliage. I really appreciate you taking the time to share your experience with ninebarks, Deb. 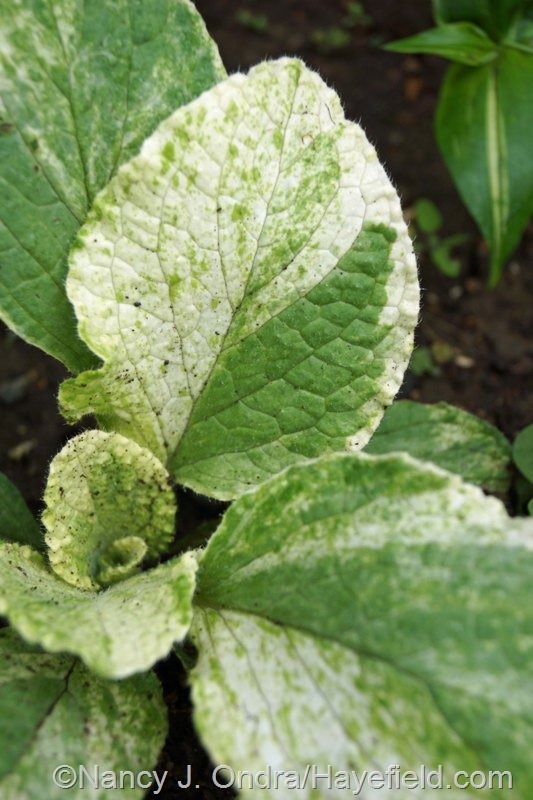 It’s particularly interesting that you mentioned having a powdery mildew problem. I’ve had it pretty bad on the yellow-leaved and purple-leaved seed-grown plants out in the shrubbery for the last few years. I usually leave them alone and they keep enough leaves to look okay for the rest of the season. But maybe I will experiment with a rejuvenation pruning on some of those too, next year. I have never thanked you for your wonderful website and your glorious book. Both are an inspiration to me regularly. Just recommended your book to one of my garden coaching clients who promptly went out and purchased it So you now have a new fan. I’ve also learned a lot from you about how to take photos in my own garden. I’ve always loved looking at the up-close vignettes of lovely foliage in my garden, but now I get real close and shoot a photo of those textures and colors. Keep up the good work! And thanks for all the great plant ideas. Hello there, Marge. It’s so kind of you to leave this lovely note, and to recommend one of my books to a client; thank you! I hope you have lots of fun with your foliage photos. I’m glad you joined in this month, Nan. I just added your link to the comments on my Foliage Follow-Up post so that other interested readers can find it too. 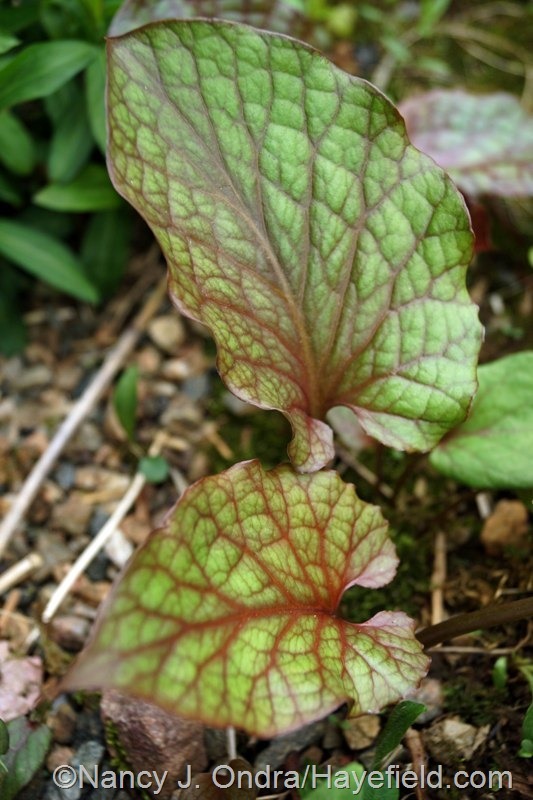 I envy your chartreuse-burgundy foliage combos, which is particularly hard to do in the Southwest. We have a much more silvery and gray-green palette to work with — which is, of course, very nice too. 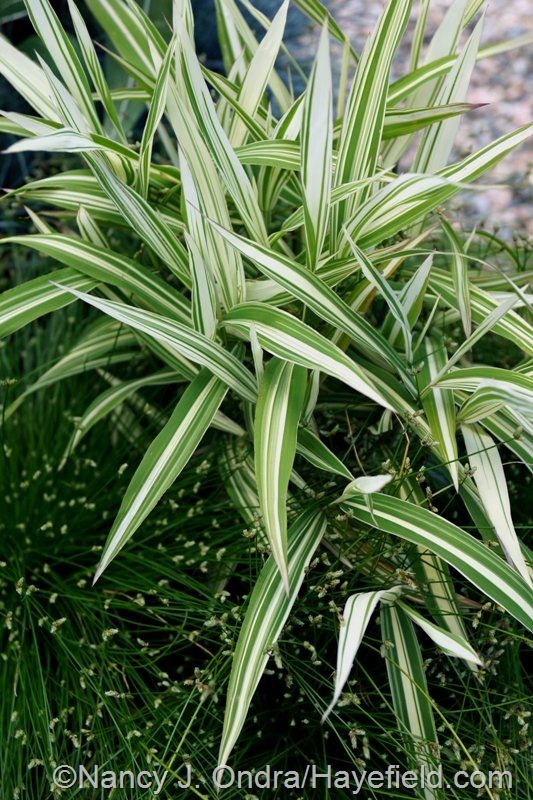 Re: your reader’s question about the ‘River Mist’ sea oats, I’m growing that too, and like you, I’m having a hard time getting it well established. 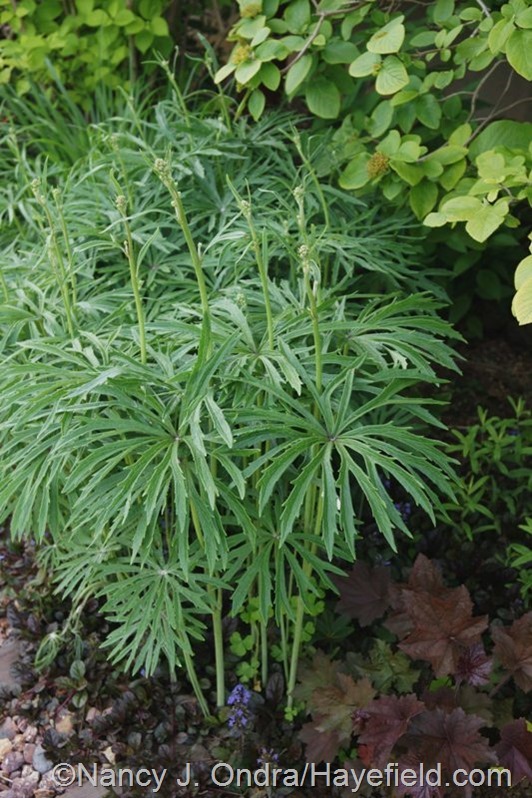 It does come back reliably every spring, but it just doesn’t grow very tall or expand. It’s still a small clump — so unlike the native variety which spreads with abandon. I appreciate that, Pam; it’s been so long that I’ve forgotten the rules! Thanks for sharing your experience with ‘River Mist’, too. I think the reason mine’s doing well this year is that I have it in a pot, where it gets plenty of pampering. It’ll be interesting to see how it responds when I move it back to the garden next year. I so enjoy your photographs! 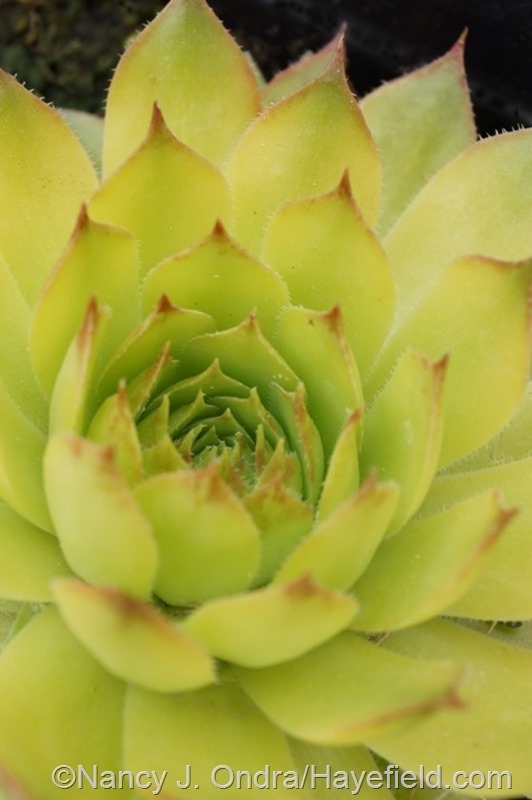 You have a true gift for combining plant textures and colors. Regarding your Golden Hops, I’ve read that hops gets huge and can become invasive. How large is the support structure you have for it? Does it spread to the point of being invasive? 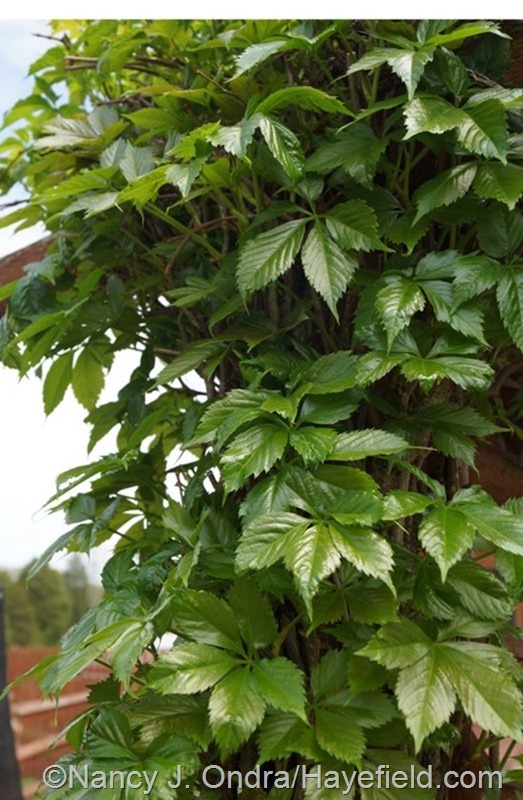 As a butterfly gardener, I would love to grow hops because it is a host plant (food source) for the caterpillars of 3 butterflies: Red Admiral, Comma and Question Mark. By the way, caterpillars of these beautiful butterflies may be the “pest” you said skeletonizes your leaves in spring. Hi Dana! The hops vine does take some serious consideration before planting. 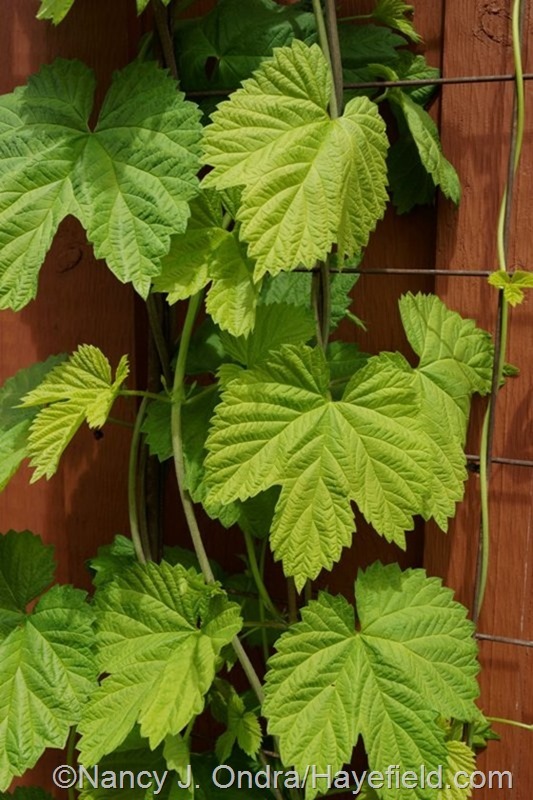 The vines themselves aren’t that heavy, but the plant spreads by vigorous creeping roots, and the new shoots can pop up many feet away. It’s not so hard to pull them out when they’re new, but you have to get the runner they’re attached to as well, or they’ll just sprout again and then spread farther. I have two on very sturdy log arbors, which is actually a problem because the vines die back to the ground each winter, so I have to untwist and clip off the dried vines in pieces each winter or spring. I’ve found the golden hops much easier to deal with where I have it trained on the end wall of the barn, with several pieces of twine attached to the wall for it to wrap around as it climbs. At the end of the season, I can just clip all the dead vines at the base, snip the twine off the nails, and bundle up the whole tangle for disposal. I bet you’re right about the creature(s) that feeds on the leaves: it’s definitely the kind of damage that caterpillars could cause, but in the 20+ years I’ve been growing the plant, I’ve never actually spotted the critters. Welcome, Jeannie! I’m so glad you found your way here–and that you like the foliage book as well. I too use it all the time. I hope you’ll visit again. Best of luck with your new site! I just found your website and absolutely love your posts and comments. I live in zone 5 (however I do plant some plants in micro-climates by the patio which shouldn’t be hardy here) my soil is wonderful and if not I work on it (some areas of my yard had to be amended). I’m so glad I found your website! Welcome to Hayefield, Margie! Thanks so much for visiting. I look forward to having you as a reader!